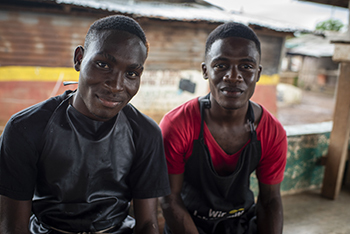 Isaiah Kpehe and Emmanuel Datokpah have a big dream: to start their own soap making business and become a major supplier in Liberia. The young men first learned soap-making skills with the help of a family member, but they quickly discovered that making their dream a reality requires more knowledge. It’s tough for anyone doing business in Liberia. But for people like Isaiah and Emmanuel, with a lack of entrepreneurial education, poor access to startup capital and limited business networks, success can seem impossible. “We were trying to help run a business but we didn't have a plan,” explains Isaiah, who is 20 years old. Then he and Emmanuel brought their dream to ASPYRE, a Catholic Relief Services’ program that stands for Activating a Supportive Platform for Young Rural Entrepreneurs. They joined over 35 other young entrepreneurs from across Liberia in a competition to defend their business proposals to a panel of investors, with the hope of securing an investment in their dreams. If those dreams come true, they will create work for themselves and their communities—something desperately needed in this country where young people account for about 65 percent of Liberia's population of 4.1 million, and youth unemployment is estimated as high as 85 percent. This year’s 35 competitors are just the first wave. Over the next three years, ASPYRE looks to reach 225 young Liberians. “There are so many youths in the streets. This project can build up peoples' lives and give them opportunity,” says one of the other competitors, Eunice Bellewah, 23, who came to ASPYRE hoping to expand her snack selling business. Mary Gbono, 26, was also there with her plans for expanding her business selling traditional doughnuts. CRS put all of the competitors through workshops, teaching them how to create business plans and other basic but invaluable skills to help them succeed. After training, they pitched their ideas to a panel of local experts who posed challenging questions before deciding which of the entrepreneurs would win external investment. The prizes are not grants but loans of around $300 from a local microfinance institution. The loans can be repaid over a period of 6 months. The recipients are also required to establish a savings plan to demonstrate financial responsibility. For most people in the room, this was the first opportunity for their businesses to see any outside investment. What’s your product distribution plan? Who are your suppliers and/or vendors? Fortunately, Isaiah and Emmanuel had a winning idea. The judges recognized that even in the worst of times, soap is one of those essential goods that people won’t do without and will still pay for. The pair, along with Eunice and Mary, are now in the process of having their loan requests approved. In the meantime, they’re thankful for the skills they gained and have begun applying to their businesses. Mary said she learned the importance of scale. “You can make more money when you buy in bulk,” she said, listing the ingredients she needs to make up to 600 doughnuts a day. “Flour, sugar, yeast, milk, eggs…,”. Training was the only missing ingredient—now she is optimistic about the future. 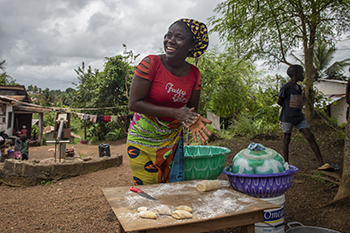 ASPYRE is privately funded, but with additional support, CRS can provide the missing ingredient to launch many young entrepreneurs—in Liberia and potentially across Africa—to newfound success.